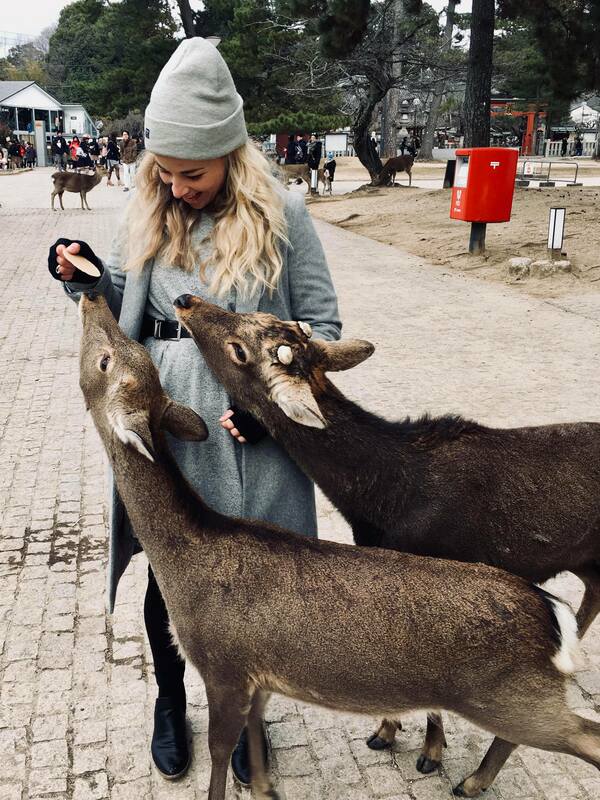 Nara was originally only on our maybe list (it was dependant on whether we could squeeze Hiroshima and Himeji in one day) and I’m so glad we made it because we had an absolute blast. It takes about 45 minutes from Osaka Station. We arrived at JR Nara Station and headed up the main street of Sanjo-dori. It had a very open-air feel about it, with lots of souvenir shops, snack food stores and vendors. 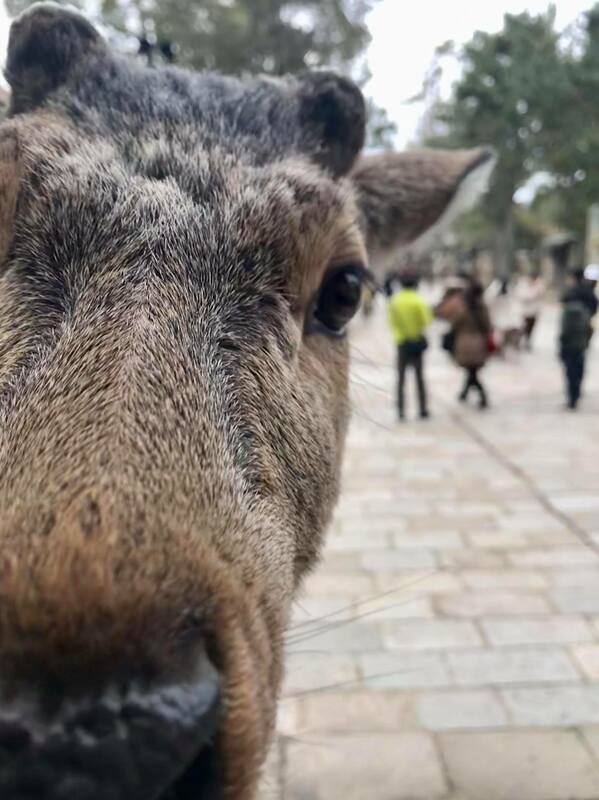 It is about a 15 minute walk from the station to reach Nara-koen, the park, and its immediately obvious not just because of the greenery, but also because of the deer. Apparently over 1200 deer reside in and around the park, and they are certainly not people-shy. In fact, quite the opposite – they absolutely love the people, especially when those people have food! 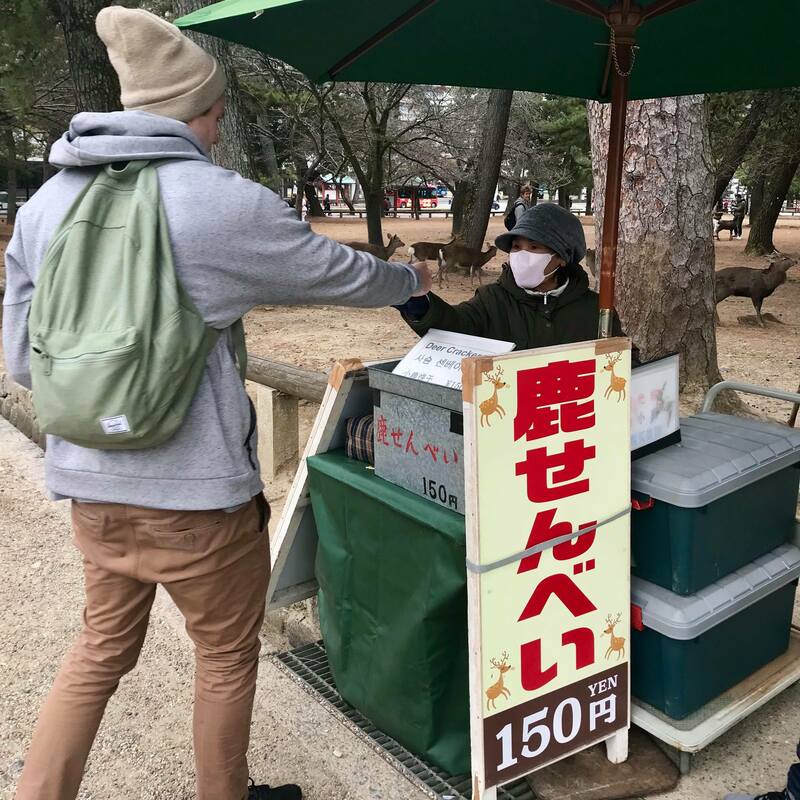 We bought some shika-sembei (deer crackers) for ¥150 on arrival, and honestly the deers were like bees to honey; so much so, that I didn’t even have the chance to grab a cracker to feed the deer myself! The deer just chased Andy, nudging and nibbling him until all of the crackers were gone. Later we had the chance to feed the deer in a more peaceful setting, and if you watch closely, you can see the deer actually bowing to you (in anticipation of being fed). We stopped for a traditional Japanese lunch at the Yumekaze Plaza, right opposite the National Museum. We were treated to miso, tempura and other goodies on rice. We decided that we quite liked this style of eating – the platters / bento boxes enabled us to try a bunch of different food without necessarily committing to one thing. After lunch we headed to Todai-ji. 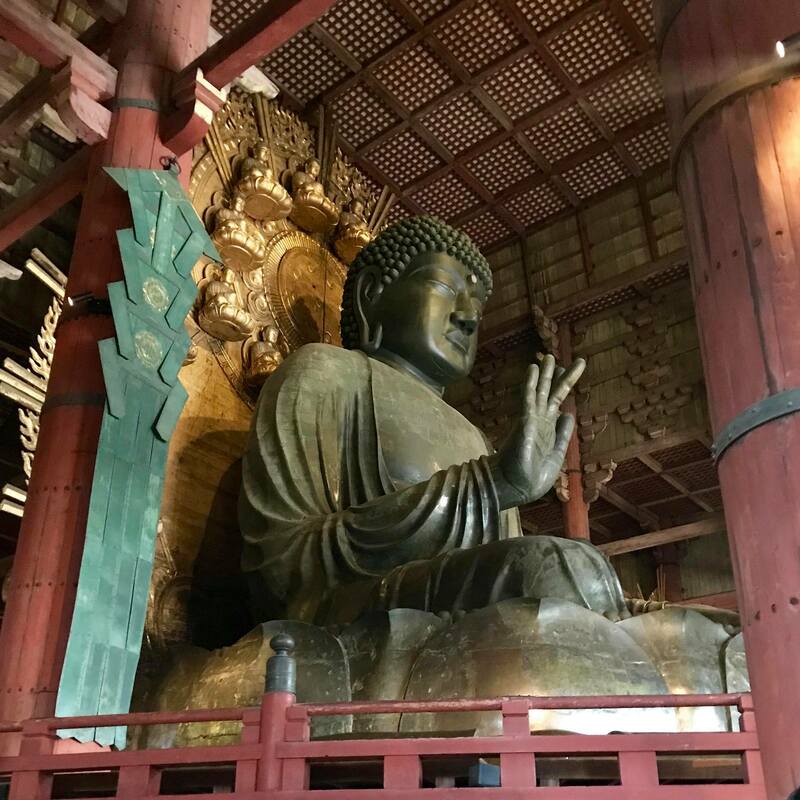 This giant temple houses the iconic Great Buddha (16m high) which is in the Daibutsu-den – the largest wooden building in the world. Admission for this was ¥500 each, and once again, so worth it. 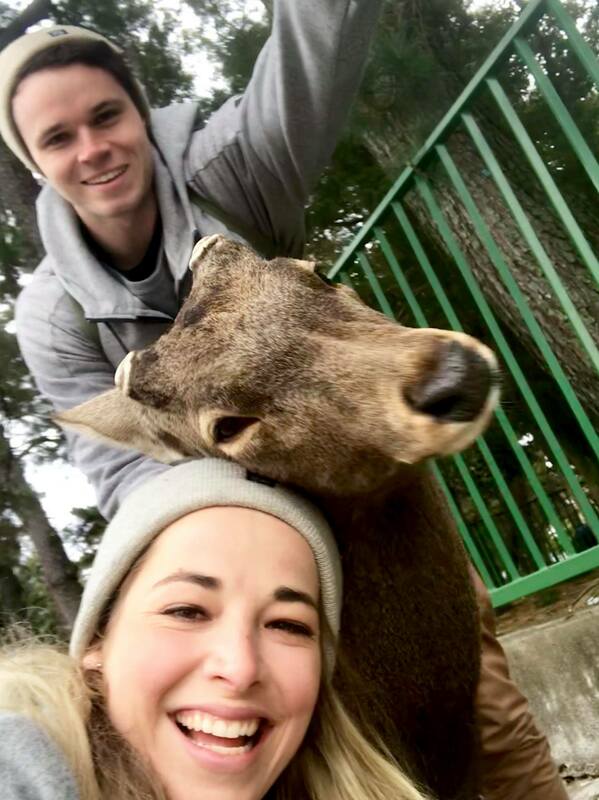 Nara is a really easy daytrip to do from Kyoto – we didn’t even take the whole day. 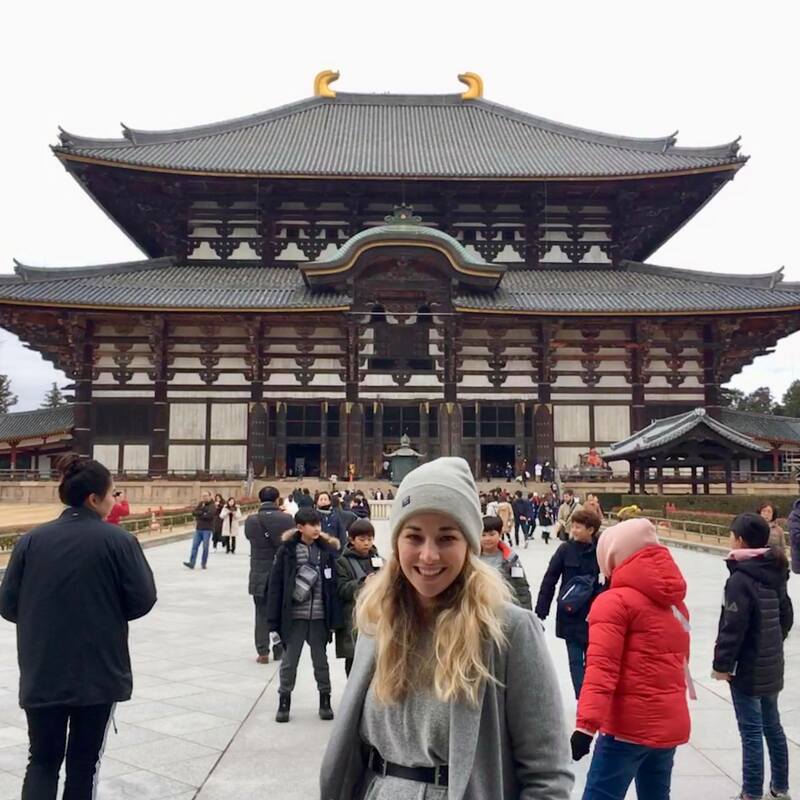 There are eight UNESCO World Heritage Sites in Nara, so you could easily spend longer at the various temples and museums if you wanted. 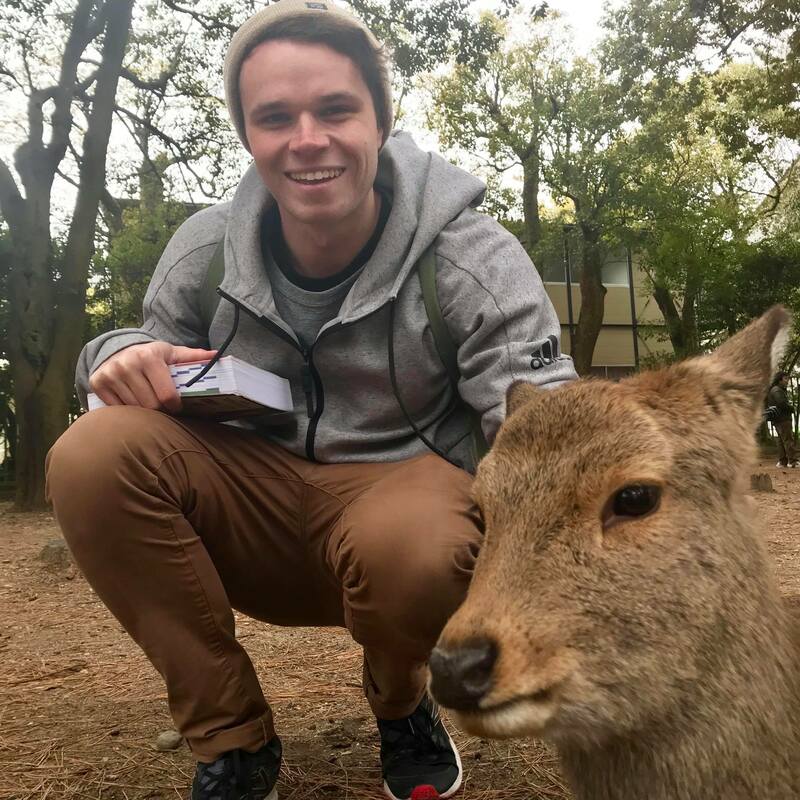 We were stoked just to see the Buddha, and unexpectedly the true highlight of the day (for me anyway) was certainly the deer! Next Post Video: Melbourne in a song!